Firefighters fighting a forest fire at Treuenbrietzen. FIREFIGHTERS BATTLING A large forest fire near Berlin had stopped its spread, a local official said, warning the danger from the blaze had not yet passed. “The situation has not yet calmed down,” a spokesman for the interior ministry of Brandenburg state told the DPA news agency. 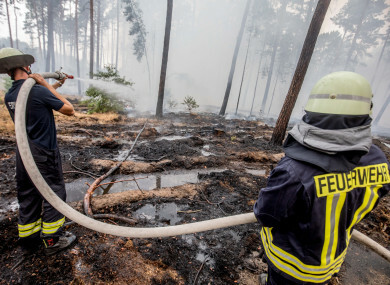 Around 600 people fled their homes in three villages in Brandenburg 50 kilometres southwest of the capital late last night as firefighters battled the blaze from the air with water-bombing helicopters. The smell of acrid smoke reached Berlin as more than 400 hectares (1,000 acres) of woodland burned outside the nearby city of Potsdam. Residents of one of the villages were able to return today, but those from the other two will not be able to do until Saturday. However they would be allowed to briefly visit their homes to feed their animals, said local official Christian Stein. “Our main goal remains to protect the evacuated areas from the flames,” Stein told DPA. About 440 firefighters will be deployed to beat back the fire over the weekend, when no rain has been forecast and strong winds could increase the fire’s intensity. He called the situation “dramatic”, saying there had already been small explosions from ordnance buried in the ground. “The entire urban area is now affected. The cause is the large fire in Brandenburg,” the Berlin fire brigade tweeted. Email “German firefighters stop spread of huge blaze but warn of ongoing threat”. Feedback on “German firefighters stop spread of huge blaze but warn of ongoing threat”.